This was really a very genuine question but the answer was fairly simple T-SQL query on “SysIndexes” catalog view which I have already written but he was not aware with so finally I thought to cover up all my Indexes articles in one post so it would become good reference for some handy stuffs. 10.) 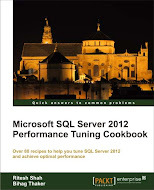 "Index Rebuild or Reorganize in SQL Server"
11.) "Index Fillfactor in SQL Server"
I will keep updating this page whenever I will write down something about Index.